Over the years as OakDOT has developed designs for repaving Telegraph, bike lanes were always in the mix. 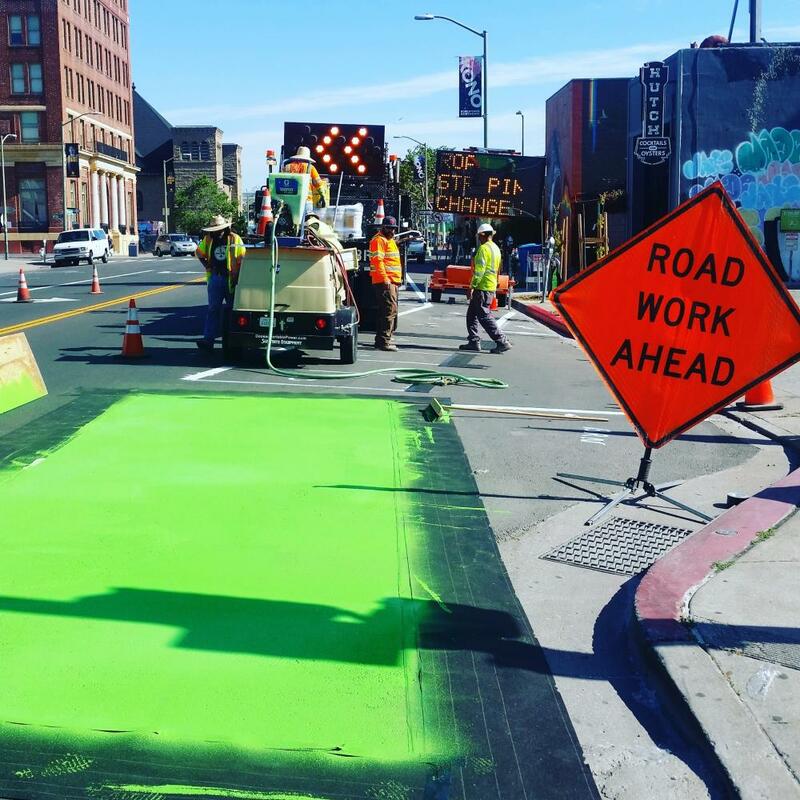 City Council approved bike lanes on Telegraph as part of the 1999 and 2007 Bicycle Master Plans, and is proposing bike lanes on Telegraph in the Bicycle Plan update. The Council unanimously approved bike lanes on the entire stretch of Telegraph as part of the 2014 Telegraph Avenue Complete Street Plan. Given Council support, two bike lane designs were developed for Telegraph: 1) protected bike lanes, and 2) buffered bike lanes. Both designs include repurposing one vehicle travel lane in each direction into a bike lane. Parking lanes remain, but 20%-28% of on-street parking is removed to improve pedestrian safety, with commercial loading zones added. Immediate spaces along side streets will have metered parking where there are businesses, adding 109 metered spaces to the Telegraph corridor. 80% of respondents requested protected bike lanes in an Oakland survey of the Temescal area. This significant preference mirrors public feedback from 2014, as part of the original Telegraph Avenue Complete Street Plan, as well as responses from a city-wide survey of Oakland residents conducted earlier this year for the Bicycle Plan update. People prefer protected bike lanes over buffered or regular bike lanes. The Temescal Business Improvement District has considered the preferred street redesign several times, and twice voted to support repurposing travel lanes to protected bike lanes, on the condition that parking loss be minimized and loading zones/drop off zones be added. In response, every business on Telegraph was consulted and OakDOT agreed to add metered parking by over 100 spaces, even though overall there is a loss of less than 30 parking spaces for the ten blocks of the project (42nd Street to 52nd Street). The result will be more people parking along the corridor, not fewer, and that of course means more customers, in addition to an increase in people walking and bicycling to shop. A win-win.